The NCHM JEE 2016 has been conducted by the National Council of Hotel Management and Catering Technology (NCHMCT) in 33 cities across the country on April 30, 2016 from 10 am to 1 pm. This year, the national level hotel management entrance test has been observed to be a moderate level exam. 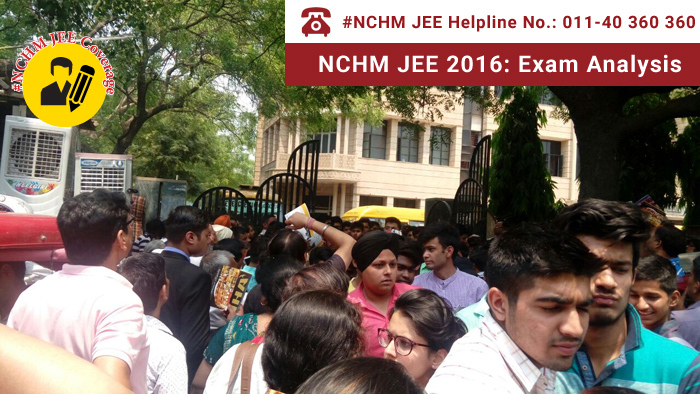 Careers360 reporters tried to gauge the mood of the candidates after the exam at various NCHM JEE 2016 exam venues. While majority of the students found the exam to be moderate in terms of difficulty level, some found it to be tougher than what they were expecting. “Service Sector was easy but Numerical Ability was surprisingly tough for me,” said Nitin, who attempted the exam for the first time. “I am not really sure what my result it going to be but I have my fingers crossed,” he said. LATEST - Candidates can check NCHM Counselling Procedure and NCHM JEE Result from here! The mood outside the exam centres was similar to that expressed by Nitin. According to most candidates, Numerical Ability was the toughest part of NCHM JEE, while Aptitude for Service Sector was the easiest one. Let’s take a look on what students have to say about the NCHM JEE 2016. Karan Gupta: Overall exam was of moderate level. Numerical Ability was toughest and Service Sector was the easiest one. I am not very sure about my result. Rashmi: Very nice exam. It was not difficult but overall a lengthy paper. Numerical was very easy. I am expecting good result. Abilasha: It was very nice. I have attempted all the questions of numerical, but only 60 percent in English. GK was toughest for me and Numerical was easiest. My expectation is to get rank in top 500. Mohit: Exam was good. English was easy, but reasoning was tough for me. It was a moderate level paper. I am expecting place in top 1000 rankers. Mohd Shariq: GK was toughest for me, but reasoning was the easiest. On expectation, I cannot say anything. Sameek: Numerical ability was toughest and Aptitude for Service Sector was the easiest part. Overall exam was moderate. Akash: Exam was fine. Service sector was easiest, numerical was toughest. I could not attempt all questions, so not much expectations with the result. For me, 50-50 chances for IHMs. Apoorva: GK was the difficult part, logical reasoning was the easiest. It was a moderate level paper. Monish: The paper was very easy for me. Numerical was toughest part, Service Sector was easiest. I will easily clear it and get good rank. Ashu: Numerical Ability was toughest and Aptitude for Service Sector was easiest. I have 50-50 expectations to clear for IHMs. Aditya: Numerical was toughest, GK and Service Sector was easiest. But I am not sure whether I am qualifying or not. Saksham: I am sure to get a merit in 400-500 candidates. GK was very tricky for me. I am from science background, so overall exam was easy for me. Around 20,000 candidates appeared in the entrance exam, being conducted for admission to 52 institutes of hotel management (IHMs), including 21 Central, 16 State Government and 15 private institutes, containing around 8,000 seats. The NCHM JEE is conducted to provide admission to 3-year B.Sc. programme in Hospitality and Hotel Administration at the participating institutes. The conducting body NCHM CT is an autonomous body under Ministry of Tourism, Government of India. Here is the exam pattern of NCHM JEE 2016 along with some other vital pointers - NCHM JEE 2016.